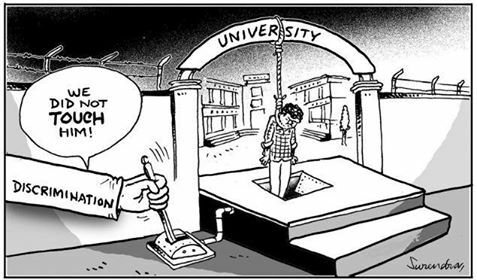 On behalf of the students struggling across the country to get the institutions to hear us, let me pass our deepest condolences to this country on the passing of the all powerful and hopeful ‘Education’. We are all saddened by the unfortunate systematic series of events that unfolded and led to the demise of Education. To say that Education was every bit of empowerment and courage for all of us would be an understatement. Education that stood for all will always be remembered, as a great domain where we all thrived for equality and freedom, and will be terribly missed. A place where at least we all felt we could as students have equal rights to come together to produce knowledge and debate is now lost. We register our utmost grief that nothing can replace the void that Education left us with. No, not the huge classrooms with microphones, laptops for all and cameras to keep a check on who is reading what, who enters the library at what time or even those cultural annual festivals that will remind us of institutional foundations and values that are long lost. Now, they will be forcefully organized by students with colourful dresses and badges claiming some position of responsibility. No, not in any capacity can merit replace the presence of Education. Merit will not even be able to begin to scale Education's absence and the loss we face. Only if our institutions had not fallen prey to arenas of political plays and partnerships, Education would not have been split into the Public and the Private, and maintained some good health. Only if our institutions had not let appointments colour our syllabus and design of learning, Education would not have turned pale as saffron. Only if our institutions had provided us roads (mechanisms) that, as marginalized students, we could have tread on without fear to confront ostracism and social boycott; we could have ushered Education out of the mishap altogether. Only if our institutions had place for more participation and representation from all walks of life, Education would have had a longer life. We hope we will still have strength and some remains of our collective identity to come together to ask for justice. The image of Education’s last breath on that fan, tied to those circulars and decisions, is fresh in our minds. We are sorry that we hear the funeral had already taken place. As the days and weeks pass by, and as the country catches back to the routine, there will be more rules and discipline to comfort us and help us adapt to a future with only an illusion of Education. We hope we gather immense strength in facing losses one after the other. The sudden death of Cinema last year, and today Education, and now wonderful memories of where we had once imagined Education to stay with us stronger in our experiments and explorations with rationality and justice will be cherished. We can only frame the last few pages on which Education survived in that hostel room, on that blue ink. The rest is the incomprehensible, stardust.